My lovely friend Zeirah and I have turned our weekly blog challenge into a public blog challenge for anyone to participate in. Each week there is a new topic for everyone to write about and share. This week’s topic is An Azeroth Holiday, and you can read everyone’s thoughts about their ideal Azeroth (beyond!) holiday locations on our website here. You can find Z’s post about the topic right here. 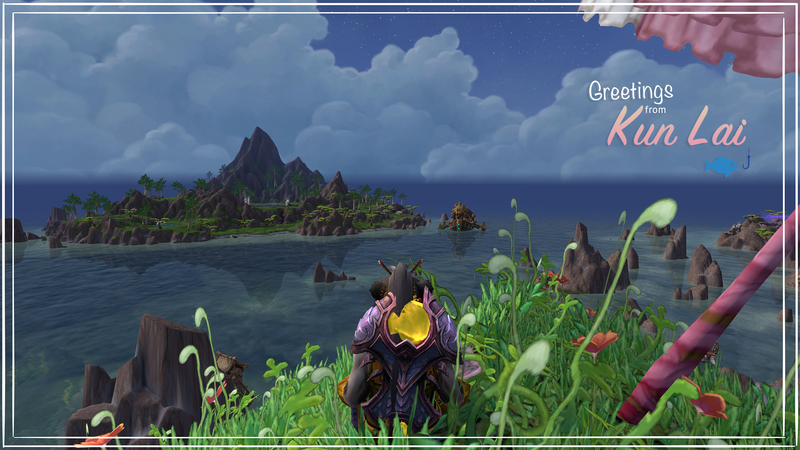 So for this one, I went on a little adventure to some of my favourite places in Azeroth, and did some REALLY BAD photoshop work to make postcards for each of the places I would love to visit. 😀 I chose a few because where I go would depend on what type of holiday I wanted to take. First up, summer holidays in Kun Lai. This is the very far north of Kun Lai, with the beautiful Kun Lai summit behind us, luscious waterfalls for miles around, a quaint little fishing village below, and a lush island off in the distance should you wish to go on a day trip. I’ve always loved this area, and to me would be a gorgeous place for a summer holiday. I LOVE Howling Fjord so much. I love the cliff edges and and the rivers and lakes and trees. It’s always thought it would be an amazing place to explore and go canoeing! So this is where I’d go if I felt like adventuring. High mountain is absolutely stunning, but even more so during the night time. 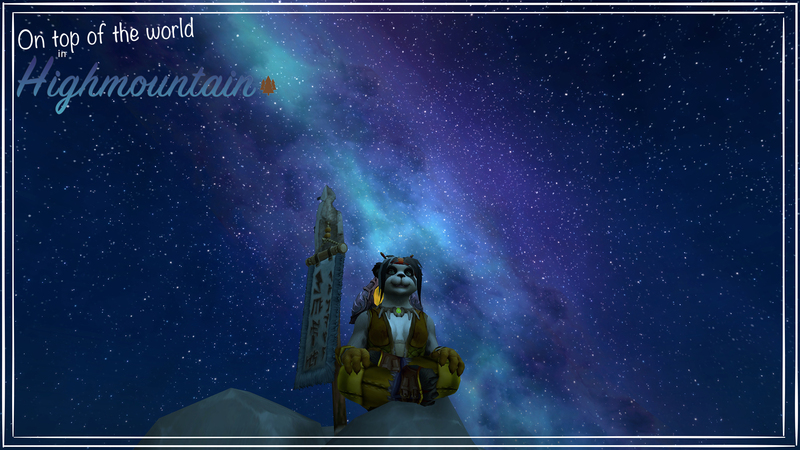 A Highmountain holiday to me is like a spiritual pilgrimage – something you do on your own to find yourself. Climbing Highmountain would be one hell of a challenge, but absolutely worth it. It would be an opportunity to learn so much about yourself – to push yourself to your limits, and find your zen. 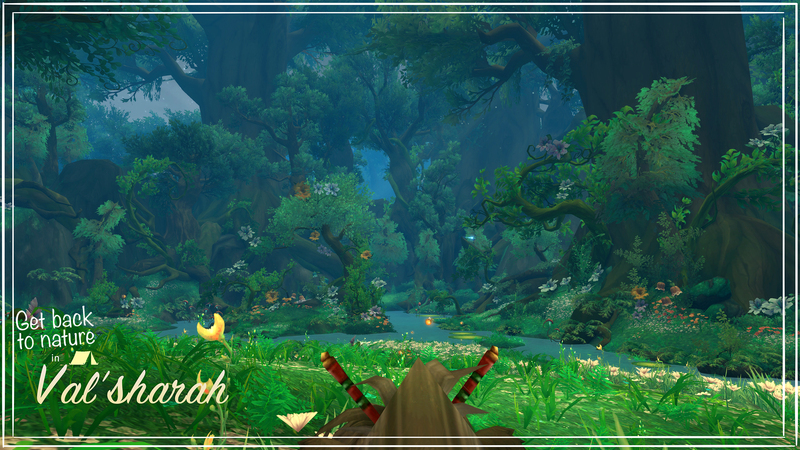 Val’sharah is so, so beautiful, and definitely an ideal place to go to get back to nature. I think you’d be hard pressed to not feel relaxed and calmed by your surroundings – just look how breathtaking it is! You just know it’s the perfect slightly cool temperature so that you can comfortably sit in the sunbeams. I feel like I could just sit here for days on end just reading. Gorgeous. 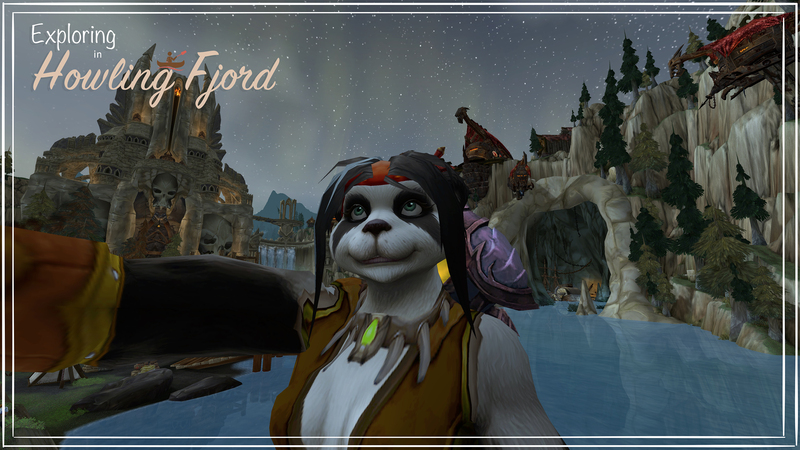 So those are my favourite Azeroth holiday destinations – where are yours? Bits and pieces for these pics came from Freepik here and here. Omg this is so AWESOME!!! I absolutely love where you took this idea! My favourites are a toss up between Kun Lai and Highmountain. Soooo gorgeous. Ulduar is my all-time favorite place, just because of all the fun times I’ve spend there during the WotLK raids. Nostalgia! oh isn’t it just stunning? Val’Sharah really is just absolutely gorgeous. So calming. Which makes me want to fight REALLY hard to get rid of the nightmare corruption there – I want it to stay beautiful!